We are so excited about the prospect of working with you to create the most magical wedding day ever! Below you'll find: details about our Full Service Experience and the process we'll walk through together, pricing information with ranges for some of the most common wedding arrangements, and details on our design + planning services. If you have any other additional questions at all, don't hesitate to reach out! We can't wait to meet in person and talk more details! 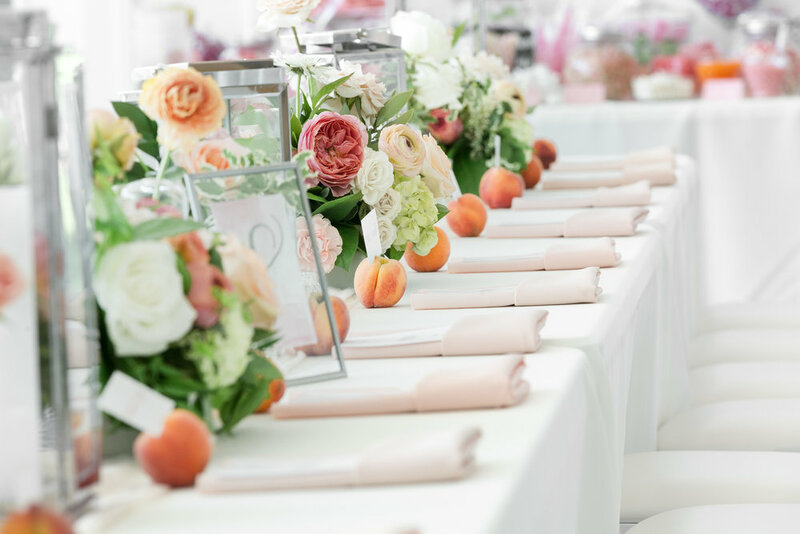 Initial Consultations - When we first meet and discuss your event, we'll create a custom line itemized proposal to give a you a very clear picture of your wedding day blooms and the investment. Substitutions - Substitutions and adjustments are allowed up until one month prior to your event! Styles can change, guest lists can fluctuate, so we build in lots of flexibility to ensure you get exactly what you need! Unlimited Availability via Email & Text - We want you to consider us your Creative Best Friend! Feel free to contact us any time with questions, concerns, or just to say hi. During busy times, wedding weekends, or out of normal office hours, we may not respond instantaneously, but we'll always get back to you asap! Midway Meeting - We love sitting down for a meeting around the six(ish) month mark to go more in depth in the types of arrangements, flower varieties, and vessels you're envisioning for the over all design. This can also be very helpful for large scale installations or designs that require outside rentals. More complicated designs and installations may require a site-visit together and that can be arranged at any time that is convenient! Final Design Meeting - Let's finalize all designs and quantities over some bubbly! We have a firm "no leaving stressed" rule for this meeting. Bring all your questions and we'll be happy to cover everything to make sure you're feeling confident and ready to see your event pull together. Complimentary Toss Bouquet - Just a fun little freebie for you! Not doing a bouquet toss? Let's turn it into another small detail like a sweet bar arrangement or some cocktail table flowers! Pricing begins at $2500 and can vary depending on the complexity of your event. Our typical couple spends around $4500 with us. 25% is due at time of signing to reserve wedding date. The remaining balance is due one month prior to event date, after all designs and quantities have been finalized. Though every client has different needs, these price ranges are a good place to start to gauge pricing for typical wedding arrangements. During our initial consultation, we will discuss your specific needs and create a custom, line- itemmed proposal that will outline everything in great detail. Flowers are such a big part of the wedding design that it makes sense to let your florist help with the decor and design of the rest of the day! From paper to favors, signage to place settings, let us help take the ideas floating around your head and Pinterest board and make them a reality! Five Design & Planning Meetings - Design meetings are the perfect place to hone your vision from all of Pinterest, to a unique and highly customized design plan. With your style and our design eye, we’ll create a wedding design that captures your style and stands out from the crowd. Budget Development - This is usually the most difficult element of wedding planning for most people. We can sit down and help you determine how much you have to spend and how to get the most out of that budget. Design Development + Custom Design Plans - From colors to decor to unexpected elements, we'll create a design plan to bring your ideas to life. This includes providing ideas and resources for any DIY projects you might be considering! DIY + Custom Element Assistance - Up to 10 hours of personal assistance to help execute DIY projects, purchase decor, create Custom Elements. Venue Site Visit - We will visit the venue together to discuss design elements, the flow of the event, venue rules and regulations and everything in between!